For adding a Photo Album or Image Gallery to your Church Website, I recommend NextGEN Gallery this is a bit confusing to setup at first, but it's robust and provides you with a great set of features. Again install the plugin and activate it. A gallery is collection of images that can be inserted on any Page on you website. These are generally a collection of images that fall into the same category or grouping. An example might be a Youth Gallery, which would contain photos of the youth for your Church Website. An Album is a collection of Galleries. Again these are a collection of galleries that combine to make a single grouping. You could have a set of Galleries of your Sunday School classes, and combine these into a Sunday School Album. To add a Gallery goto Gallery -> Add Gallery / Images. This will bring up a new page, click on the tab Add New Gallery. From here you create a new Gallery by entering the name of this Gallery. Now to adjust the properties and settings on your newly created Gallery go to Gallery -> Manager Gallery. This allows you to see a list of all your Galleries for your Church Website. Please take note of the ID for you Gallery, this is how you insert your Gallery into a Post or Page. You take the ID of the Gallery you want to insert into a Post or Page and enter this text [nggallery id=1], where the id is set to ID of your Gallery. From here you can change the title, enter a description, change the author, or select the preview image for this gallery. I do NOT recommend you change the Path, Page Link To, or Create new page, unless your very knodlegdable about WordPress and Operating Systems. At this point your Galleries should all be setup and your ready to start adding images. 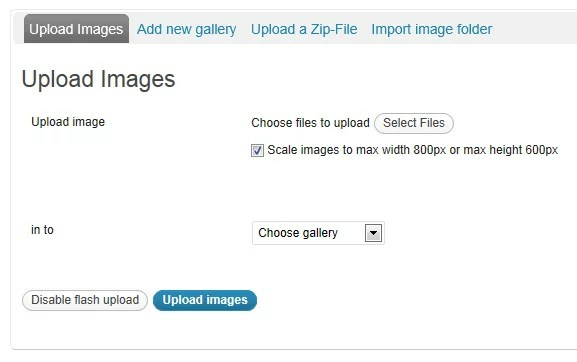 You can choose multiple files at one time to upload, you then simply select the Gallery you want those files uploaded to, then click on Upload images. It's that simple. How much better can it get. From here you can create your Album, select an Album, and drag albums and galleries into the album. To add an Album to a Post/Page look at the Album ID in the Select Album box, and insert the following test: [album id=1]. Now there are tons of additional things you can do with your Albums, Galleries and Images. A great resource for additional information would be the NextGen Tutorials.